It is the dream off all women to have soft and lustrous hair that one can easily manage. You can dress such hair in any style and you will look amazing. Having healthy hair needs lots of pampering and care. This is because our hair is exposed to lots of pollution and chemicals in the hair care products that we use. The food you eat also has a part in making your hair healthy. Nutrition is important for proper growth of hair. Good nutrition reflects itself on your hair and skin. Nutrition helps in fortifying the hair follicles and the scalp. So, have a balanced diet to improve the health of your hair. Bean sprouts are rich in silica and are essential for preventing hair loss. Your body needs silica to absorb minerals and vitamins. Even if you take in enough of vitamins and minerals, if your body lacks silica, your body will not get enough nutrients. To grow well, hair needs nutrients. You also get silica from cucumber, potatoes as well as green and red peppers. Folate is also essential for hair growth. Coriander is very effective for preventing hair fall and thinning of hair. It helps in removing the toxic metals from your body, which can interrupt with the transportation of nutrients to the scalp, leading to dry hair and hair loss. Dairy products are rich sources of calcium, protein as well as whey proteins and casein. So, try to include them in your daily diet. Hair is mainly made up of protein and keratin. So, by having a protein rich diet, you can promote hair growth and prevent hair loss. Eggs are rich sources of Vitamin B12 and proteins. These penetrate into the hair roots deeply and help in repairing and nourishing your hair. Egg is also rich in zinc, sulphur, selenium and iron. Iron is very beneficial for carrying the oxygen to the hair follicles. Iron deficiency can lead to hair loss. Egg is also rich in biotin and sulphur, which are needed for the production of keratin and for the prevention of hair loss. Lean red meat is great for preventing lose of hair. This is because it is a rich source of iron. This gets easily absorbed and helps in keeping the hair follicles healthy. Iron enables other nutrients to get easily absorbed by the hair follicles. Sulphur present in it helps in increasing blood circulation and promotes new hair growth. By decreasing inflammation, hair loss is also prevented. The liver is loaded with Vitamin A and Vitamin B3 which help in increasing blood circulation in the scalp. Oysters are rich sources of zinc, which is effective for healthy hair. Lack of zinc can cause hair loss as well as dry and flaky scalp. It is also rich in proteins and iron. Salmon is a fish rich in omega 3 fatty acids and Vitamin D, and also in iron and Vitamin B12. About 3% of the hair shaft is made up of fatty acids. Omega 3 is found in the cell membranes of the skin of the scalp and in the natural oils found in the scalp. Having a cup f tofu provides you with 6.7 mg of iron. Iron deficiency is often the cause for hair loss. So if you suffer from iron deficiency, have 18 mg of iron daily. Asparagus is rich in folic acid. This helps your body to absorb more proteins, thereby allowing your hair to grow fast. Asparagus is also rich in vitamin A, C and E, as well as silicon, fibre and iron. All these help in giving you healthy hair that is thicker and shinier. Dry fruits and nuts are rich sources of iron, biotin and sulphur, which help in healthy hair growth. They are also rich in Vitamin E and inositol, which enhance the blood circulation in the scalp and prevent hair fall. Flax seeds are rich in iron as well as omega 3 fatty acids, which help in providing you healthy hair and scalp. You will get 2.3 mg of omega 3s from one teaspoon of whole flax seeds. Poultry, especially chicken, is loaded with proteins, zinc, iron and Vitamin B. these help in keeping the hair strands thick and strong. 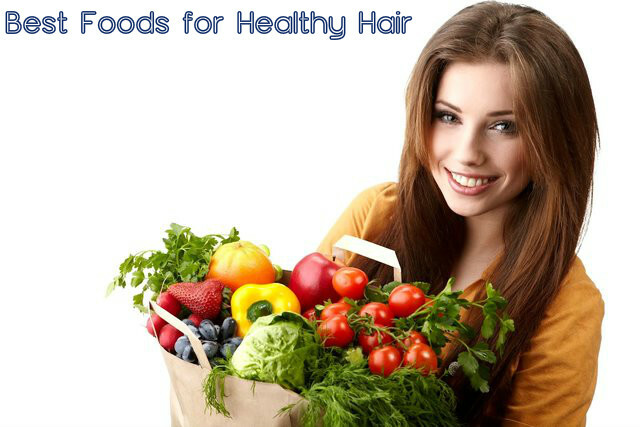 Oats, green vegetables, milk, sprouts and soya bean are other foods beneficial for healthy growth of hair. Broccoli has more Vitamin C than the orange, and is also rich in Vitamin A. it helps in conditioning your hair naturally, and provides shine to your hair. Citrus fruits like oranges are rich in Vitamin C, and are great for your hair. Collagen formation is promoted by this vitamin. Vitamin C helps in providing you shiny ad radiant hair that is bouncy and naturally moisturized. Legumes like peanuts, kidney beans and chickpeas are rich source of natural oils, which help in keeping your hair well moisturized. They are also rich in proteins. Lentils are rich sources of proteins, iron, biotin and zinc. Mangoes, tomatoes and avocados are also good for adding shine to your hair. The antioxidants present in blueberries fight against the free radicals causing split ends and hair discoloration. Fish oil is great for improving the texture and overall makeup of your skin. It prevents scalp from getting dry and prevents dandruff. Beta-carotene is an antioxidant found in sweet potatoes. This gets changed into vitamin A in our body. It helps in protecting and producing oil in the scalp. Vitamin A deficiency causes itchy scalp and the formation of dandruff. Drink lots of water to keep our scalp hydrated and to promote blood circulation. This way you will have healthy hair without dandruff.